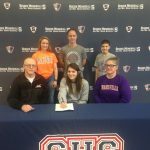 Scout Puterbaugh has signed to run track and cross country at the University of Evansville. Congratulations! There will be no boys basketball game tonight. Rensselaer is out of school today and can not play.